 Use this dip with crudités. It’s very nutritious, and so much better for you than dips made with mayonnaise and sour cream (both photos courtesy Seed And Mill). 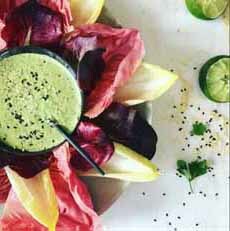 For a more sophisticated take on crudités, use green and red endive leaves. How about a green dip and sauce for St. Patrick’s Day? This recipe is from Seed And Mill, our favorite source of artisan tahini and halvah. Dip away, or drizzle it on roasted vegetables, salads, meat or fish. Tahini is ground sesame seed paste, a Middle Eastern staple. Look for unhulled tahini, made from the whole sesame seed, leaving its nutritional value intact. It’s rich in minerals such as calcium, iron, lecithin, magnesium, phosphorus and potassium. It’s high in vitamins B1, B2, B3, B5 and B15, and vitamin E.
It has 20% complete protein, making it a higher protein source than most nuts; and it’s easily digestible [source]. The ground paste is mixed with a bit of oil for a consistency that’s similar to homemade peanut butter. Americans eat most of their tahini in hummus, where it is the second ingredient after chickpeas. 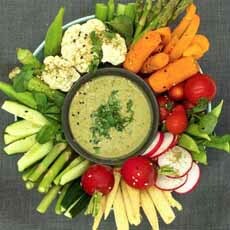 Tahini is also used in salad dressings, sauces for lamb, fish and chicken, dipping sauces and many recipes (even ice cream!). You can substitute it for peanut butter in dishes like Chinese Sesame Noodles. If you want a more vibrant green color for St. Patrick’s Day, add a drop of food color. 1 cup parsley or any combination of mint, cilantro etc. 1. PULSE the ingredients in a blender or food processor until smooth. That’s it! Keep it in the fridge for up to 3 days.